I was trying to clean up my desk today, and was struck by the coincidental juxtaposition of random items from experiments done earlier this month. They seemed to just fall into place and, with a few simple adjustments, I had my 'Leftovers Card'. The background is a technique I learned from Helene Metevier over at Magenta Style. I used 2 border designs of 'Peel Offs' as follows. Adhere the stickers to some fabric first to reduce the stickiness. Your jeans will work. Then lay them side by side on the c/s you wish to alter (there were 5 strips laid on the paper for this project.). I used a white 5x7 card. Sponge the ink onto the c/s over the stickers. My color choices were teal and cool carribean by SU - you can apply as many colors as you like. Then carefully remove the stickers and re-store them to use again at a later time. The flower is made with the Fun Flowers die from SU. 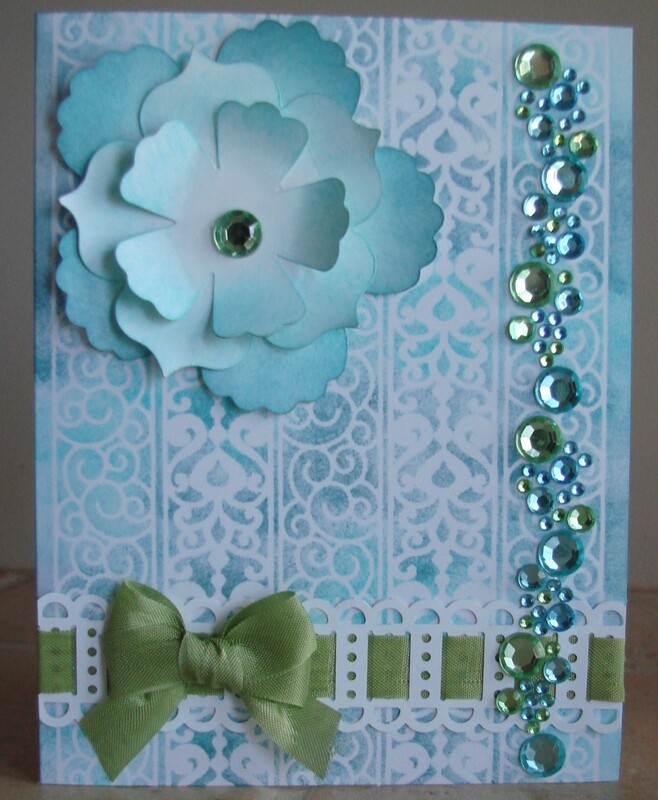 I sponged ink on the petals before putting it together and attaching it to the card. The white strip across the bottom is made using a MS punch and SU's pear pizzazz 1/2" seam binding is woven through it. A bow tops it off. The rhinestones are Recollections from Michaels and I used one extra rhinestone for the flower center. The only thing not lying around on my desk was the ribbon. Now that is serendipity. And look, Ma, no layers! I will finish this post with a photo of this visitor we had in our back porch last week. His wingspan was a good 4". If you look closely, you can see the screen through his wings. I can not figure out how he got in as the porch is screened in and no one had been through the outside door in a couple of days. Sadly, I could not get him back outside and in the end, he did not survive. So beautiful though. Judi, this is gorgeous. Beautiful card.